Serpentine belts are less prone to slipping than a standard fan belt due to the increased area that the belt can make traction between the ribs of the pulley. This is one of the reasons modern cars are equipped with them. They are also less prone to flipping, and do not require shims to adjust. 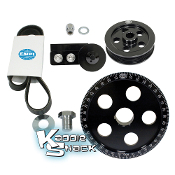 This pulley set up replaces your stock cranksahft and alternator/generator pulley and has a bolt-on belt tension adjuster that installs using two of the bolts from your alt/gen stand. It comes with a belt, and all the installation hardware needed to complete the job. Additionally, it comes with laser-etched timing marks that will not wash off.